Fudge and caramel connoisseurs are guaranteed to fall madly in love with our selection of award-winning, hand-made Burnt Sugar confectionery products. Made from 100% natural ingredients (including unrefined sugar), Burnt Sugar's mouth-watering sweets owe their strong and rich caramel flavour to a process that involves being cooked for as long as possible without being burnt! Whatever your choice, you won't be disappointed. 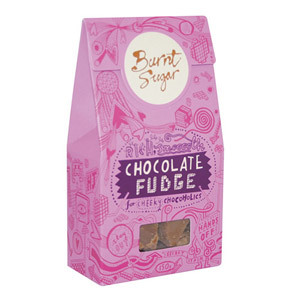 Burnt Sugar confectionery does make a great gift, but it's so good we wouldn't recommend giving it away in a hurry!